A large, spacious lot is adjacent to the restaurant. Indian flute music on select nights. Situated in the Red Rocks country 17 miles southwest of Denver on Hwy 285, The Fort is a true replica of Bent's Fort, the first American community west of the Missississippi & rendezvous of Kit Carson & other "Mountain Men". The nine dining rooms, seating 350, are white plastered over adobe. Unusual but hearty dishes, typical of the early West, are provided from open grills. Waugh! Dressing Choices: Chunky Danish Blue Cheese, Herbal Damiana* House Vinaigrette, Buttermilk Ranch, Chipotle Honey or Balsamic Vinegar & Fine Extra Virgin Olive Oil *Reputed aphrodisiac herb. A selection of pumpkin walnut muffins and dinner rolls. Seven crisp greens topped with pickled ginger, diced jicama and toasted pepitas. Add smoked duck or guacamole. All of The Fort's buffalo (bison) are from selected ranches in the Rocky Mountain Region. Add a side to any entree of an elk chop, buffalo sirloin, duck breast, lamb T-bone, buffalo rib or quail. So tender, it's like the first kiss! The most tender of all, choose from an 6-ounce or 8-ounce buffalo filet with seasonal vegetables and Fort potatoes. Market Price. A favorite of Kit Carson, who was commissioned to provide 1,000 lbs. of buffalo meat to Bent's Fort in the 1840's. Two 5-ounce buffalo sirloin medallions, full of flavor for the hearty appetite and served with seasonal vegetables and Fort potatoes. Another of Kit's "favorites"! Sink your teeth into a juicy 16-ounce buffalo ribeye steak, grilled to perfection and served with seasonal vegetables and cheddar garlic mashed potatoes.Market Price. Bent's Fort's cook, Charlotte Green would've approved! Buffalo ribs are BIG with tender meat falling off the bone! Smoked buffalo ribs, slowly roasted and smothered in our tangy Jack Daniels barbecue sauce. Served with campfire beans and and cheddar garlic mashed potatoes. Try them All! 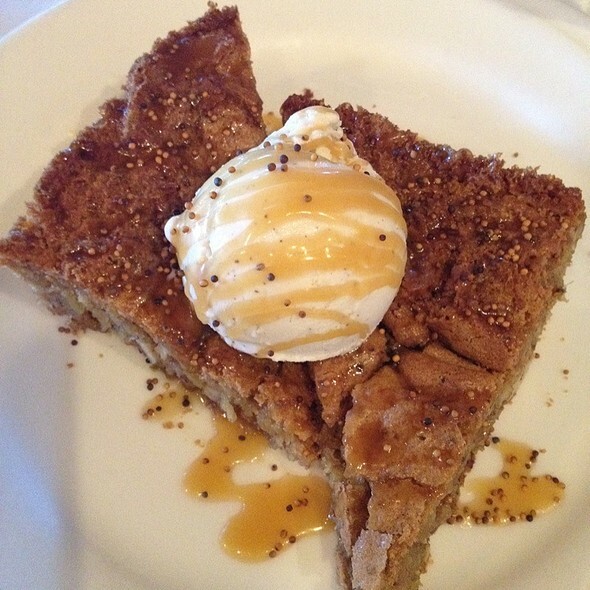 Our most popular dish! 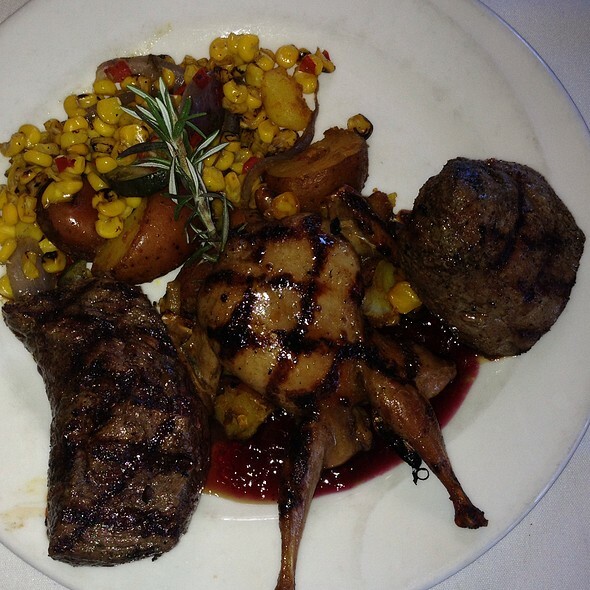 A bone-in elk chop, buffalo sirloin medallion, and a grilled teriyaki quail. Served with seasonal vegetables, and Fort potatoes, and wild Montana huckleberry preserves. Sissy Bear's paw print denotes a heritage recipe featured on The Fort's menu in the 1960s. William Bent, founder of the original Bents Fort in 1833 in southern Colorado, was also well known for raising high quality Colorado cattle on his ranch in the 1850's… we've searched out the best beef there is to offer in the West, and are now proud to provide you with what we are certain would make William Bent proud! Our beef is processed here in Colorado. Our beef is cared for by hard working ranchers who take great pride in not just knowing and understanding how to raise world class cattle, but equally important to respect the environment and land. Our beef is as important to us as our chef and staff, who prepare the final touches to your carefully grilled steak. Our aged beef is truly a farm to table "Colorado Proud" process and with this pride in our Colorado and Western heritage, we proudly present our Western beef program. Waugh! Add a side to any entree of an elk chop, buffalo sirloin, duck breast, lamb T-bone, buffalo rib or quail. The marbling speaks for itself, tender, and rich with flavor! Served with seasonal vegetables and Fort potatoes. so tender it is like the first kiss! 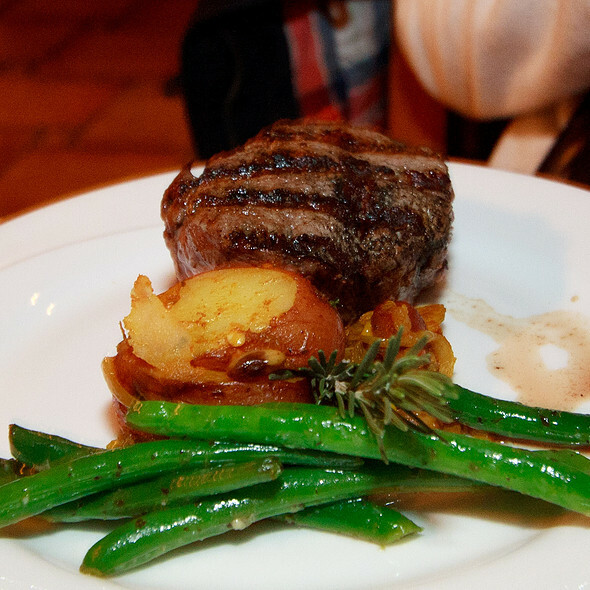 6-ounce center cut beef filet grilled to perfection, served with seasonal vegetables and Fort potatoes. Our 14-ounce Colorado natural beef NY strip, topped with a blend of melted Mexican cheeses, New Mexican dixon red chile sauce and a fried egg, served with seasonal vegetables and Fort potatoes. A 14-ounce Colorado natural beef NY strip, stuffed with New Mexican hatch green chiles and topped with a freshly grilled chile pod, served with seasonal vegetables and Fort potatoes. Have any steak prepared Incorrect Style or Gonzales Style. Sissy Bear's paw print denotes a heritage recipe featured on The Fort's menu in the 1960s. -Ceran St. Vrain was Bent's partner in the 1840's, when they were forming the Bent St. Vrain Company. 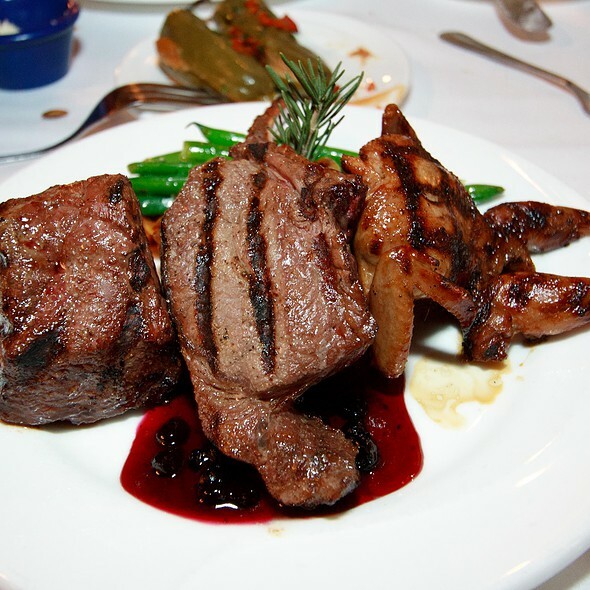 Two 4-ounce bone-in elk chops, grilled to perfection with wild Montana huckleberry preserves. Served with seasonal vegetables and Fort potatoes. He was known to steal your sheep and then sell them back to you in the 1840's! Two grilled tender Colorado lamb T-bones, served with Egyptian Mint Sauce, seasonal vegetables and cheddar garlic mashed potatoes. Alexander Mackenzie, the Scottish explorer before Lewis & Clark expedition would approve! A filet of fresh Scottish salmon from the North Sea, gently sauteed in a dill, white wine, and butter sauce, and topped with toasted pinon nuts. Served with seasonal vegetables and coconut rice quinoa pilaf. Josefa was Kit Carson's beautiful wife! Green chile and cheese vegetarian tamales with New Mexican red chile gravy and Mexican crema on top. Served with Zuni succotash with toasted pepitas. Six large shrimp dabbed with herb butter, fresh garlic, and lemon, wrapped in a foil pocket, that when placed over our grill, steams the shrimp and then balloons while cooking. Served to the table en balloon, with seasonal vegetables and coconut rice quinoa pilaf. Add a side to any entree of an elk chop, buffalo sirloin, duck breast, lamb T-bone, buffalo rib or quail. This is a favorite of hunters and duckmeat lovers...so tender and delish! Two pan seared, tender duck breasts with an ancho chile and orange glaze. Served with seasonal vegetables and coconut rice quinoa pilaf. Quail roamed the prairies in the 1840's and was a favorite food of American Indians and fur trappers! Two teriyaki marinated quail served with wild Montana huckleberry preserves, seasonal vegetables, and Fort potatoes. President Jefferson's Favorite Mild Green Chile Mac N' Cheese "Pudding"
Our version of his recipe served at the White House in the early 1800's. Ask your server to add Red Chile or enjoy plain to make your mac n' cheese Fort style! Substitute any starch with President Jefferson's Favorite Mac N' Cheese. *Regarding the safety of these items, written information is available upon request; Consuming raw or undercooked meats, poultry, seafood, shellfish, or eggs may increase your risk of foodborne illness. This item can be cooked to order. Love thos place and today was perfect as always. Had the buffalo filet mignon, perfection. The Fort continues to be the region's best dining experience, we've been coming periodically since 1975 and nothing has passed the test of time in the front range as well as its iconic location and experience. Always love going to the Fort. The Quail is the best. The experience was amazing, the food was amazing, and the view was amazing. The only thing that took away from our experience would be that our server really didn’t seem like she wanted to be there. The atmosphere was great and service was excellent. The food is way over priced for what you get. The steak was big but grisly and not all that tender. I could have got a better steak at a much lower priced restaurant. It is one of those places you should see once but I will not be going back. Have to try the bacon-wrapped quail and the bison it's amazing. And the creme brulee wow!! The Fort provides a memorable experience. The service is fabulous and the food is delicious. Steaks were a bit burnt not by much and not the norm. Prices have gone up. 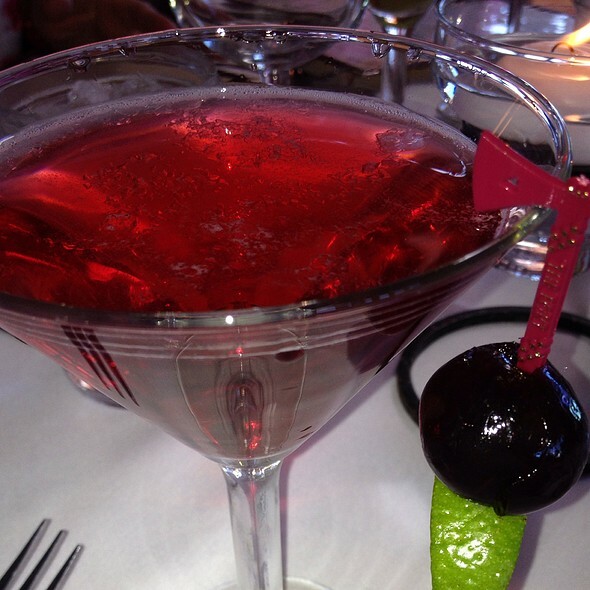 We love celebrating special occasions here! The food and service were wonderful as always. Thank you for a great evening! The last few times we have been, we noticed the mashed potatoes were more like instant mashed instead of real potatoes. The red chili sauce on them was good but the mashed potatoes were horrid. When you pay the big bucks to eat at places like this, we need real mashed potatoes. Very disappointed in the mashed potatoes. The green chili mac and cheese was not the same either. Maybe the time of year? Green chili's were canned not fresh which was a little disappointing too. Other than that, the rest was great. The food is just OK for the price. Id go somewhere else for $80 per person (tip included). The service was good and the restaurant ambiance is nice. Had a great time on our anniversary. Our waiter, Kevin, was outstanding! Food was excellent as well. Highly recommend. Be prepared to pay, it is not a cheap place to dine however well worth the prices. Great food and exceptional service. Very pricey for sure! Wonderful evening at The Fort for our granddaughters 17th birthday. We were there for my mom's birthday. They treated us totally! Even did a toast & gave my mom free dessert. We had some food allergies, and the staff was sensitive to our needs. The location is unique & the view beautiful. The food was excellent. Various meats mostly, cooked perfectly to order. 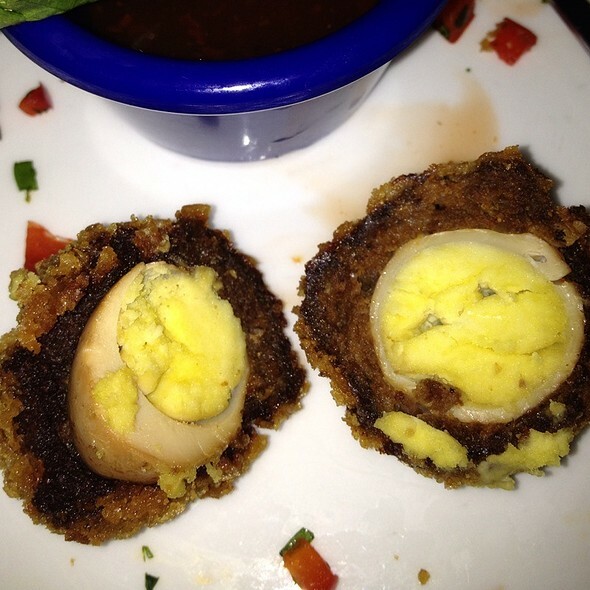 For appetizer, the buffalo eggs were delicious. The sausage house made. Even the desserts did not disappoint! The prices were a bit high, but the quality & ambiance was included. So worth it for a special occasion or splurge. Outstanding food and service. One of our favorites in Denver. The prices are a little steep so we don't go often, but when we do its always enjoyable. Wonderful experience and food- which is a bit pricey depending on what you order though. Guac and chips- paid too much but Buffalo Prime Rib dinner for $39- excellent! Thanks again Fort for making our dinner delightful and daughters BD dessert special. Beautiful location/outdoor patio/ fire pit : great for pictures and across from "Red Rocks" You will love not only the ambiance of story telling of life past in the Old West" but love the great variety of foods/every thing from steaks- duck, fish, to buffalo! and wild game! We loved the bean dip/spicy! but delicious and the array of wild sausages is sure to be hit when sharing! Great Warm Service! 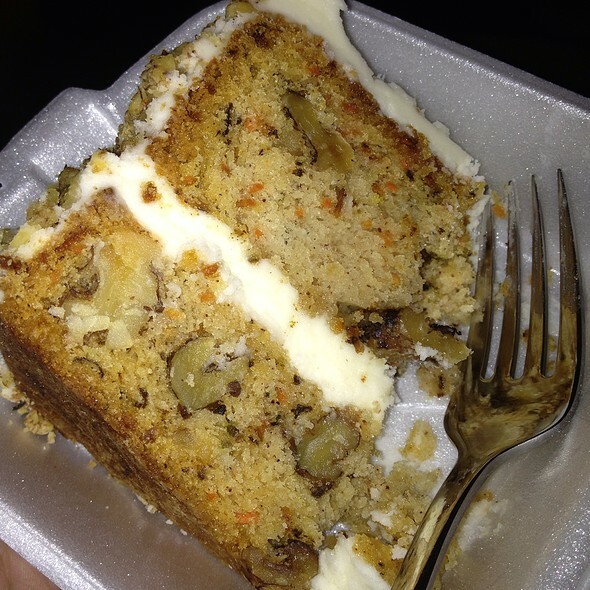 We split desserts/because they are large and plentiful! and the coffee and wines are Great! Little pricy but worth it!!! P/S We loved Thanksgiving there with our family and huge hit with our adult children from N.Y. , We will be Back!!! It was our first time at The Fort and we enjoyed the experience overall. We were disappointed that the storyteller didn't make an appearance, and my wife did not like the gravy on her potatoes, but otherwise it was definitely an enjoyable evening. Dining at The Fort is always such a pleasure. 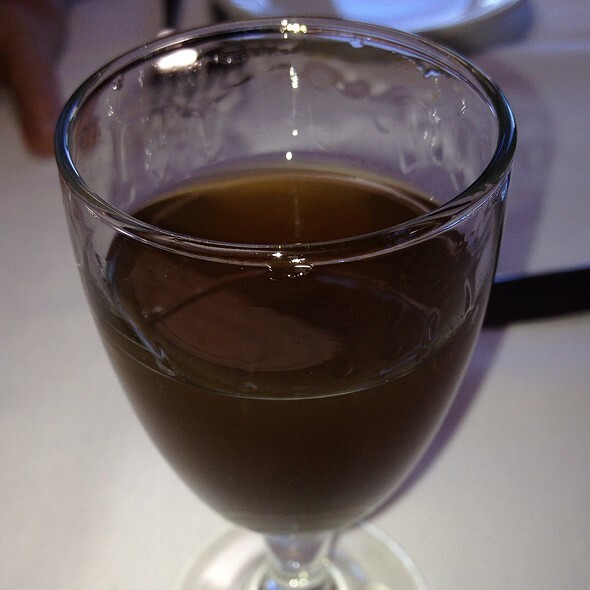 We enjoyed the marrow bones as an appetizer along with their specialty drinks made with cactus juice. The bison ribs entree was “fall off the bone” delightful and the “Mountain meets the Sea” had 6 or more huge shrimp along with a 5 oz beef steak. A new addition to the menu in the desert department (Mud Pie) finished off our meal. They are offering specialty dining experiences which are drawing us back more often than we had been coming. Friday night Fish, Dining in the Dark, Dinner and a Movie and Cooking with the Chef are just a few of their new ideas. As always, fun, fun, fun with excellent food and service. And who can say anything bad about that spectacular view of city lights after dark! We’ll be back soon! The food is overpriced for the what you get. The walleye was $42 and it had small bones and still had fish scales, over cooked pilaf. The bison ribeye was good. Our table for 2 was squeezed in next to a table for 6 and we couldn’t hear our own conversation. However it’s a neat old building and probably worth visiting at least once. Price is kind of high, but I have been going there for years, and never walked out disappointed! Great food, awesome place! Service and quality of the food was excellent. We appreciated the prompt service and the inviting atmosphere. It was an outstanding evening with the Buffalo Steak the best that I have ever tasted. The only downside was the door out to the firepits opening and closing causing cold drafts. Customer continued to use them even with curtains covering the door. The selections on the menu were a great choice of a diverse menu. The red chili gravy was excellent on the mash potatoes and the food was prepared to perfection. Service was awesome. Guacamole was the best I've had, lamb giblets we excellent. We've gone to the Fort several times and always a great experience. One of my absolute favorite. The patio with a view is a great feature and the food and service is always outstanding! Amazing food, amazing atmosphere, amazing experience! This was a great experience with a really cool history. The food was prepared to perfection and our server (guide) was extremely knowledgeable and his recommendations were all spot on, (still waiting on that balsamic&olive oil dressing to kick in.) :) the portions were perfect. Food was awesome, just wish that our table table would have been in a different place. They quests that were on the bench were comfortable but the rest of us that were in the chairs kinda stuck out in the path of all the waiter and waitresses coming down for the stairs. overal the food was fantastic and drinks were okay. The could certainly do some work on the martini wasn't cold. Sadly, the bar is set very low here in Colorado. A place that is supposed to be the staple of western cuisine should not be as disappointing as this place was. The ONLY restaurant ever to meet my expectations in Colorado thus far has been the Briarwood, which is of course, now closed. The food at the Fort was mediocre, elk and buffalo charred and other sides were nearly tasteless. The water was filled at the table often enough, but the other hands were scarce for drink refills, etc. I will not return to spend good money for disappointing food. Another special celebration this month and superb meal and service! Always look forward to visiting The Fort and never disappointed. Excellent service. A bit pricey, but worth the experience! This was our first time dining at The Fort and it was wonderful! Kevin, our server, was very friendly, knowledgeable and attentive. We ordered the TBone and Buffalo filet mignon, which were both deliciously seasoned and cooked. The pumpkin muffins are great! 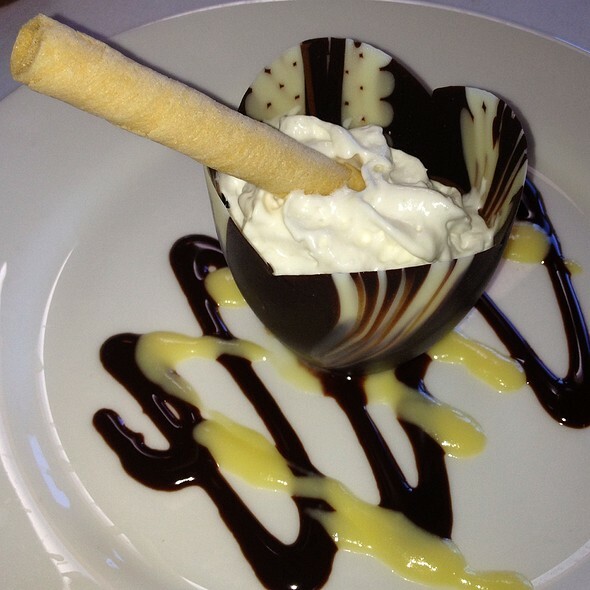 It was our anniversary and he gave us a dessert as well, which was a thoughtful surprise! We would definitely go back for a special occasion and ask for Kevin. I will let people know about my total experience. Enjoyable. I would recommend the Fort with reservations - I would let friends know that it is a neat place but that the food is very expensive. The Fort is an amazing place to dine at and will be back very soon! !